Enrico Molinaro is is founder, organizer, and fundraiser of the non-profit association Mediterranean Perspectives, and Primary Coordinator of international scholarly conferences with the participation of academic, diplomatic, religious and political authorities. He lectures at Luiss University’s Doctoral Program of Political Theory, and at La Sapienza University’s Master Program of International Protection of Human Rights in Rome, Italy. He has also authored the book Negotiating Jerusalem (Passia, 2002). Throughout history, Jerusalem and its Holy Places have been the objects of fierce religious controversy over worship rights, such as the Holy Sepulchre inter-Christian disputes and the Har Ha Bait/Haram Al Sharif (Temple Mount/Noble Sanctuary) Israeli–Jewish/Palestinian-Muslim disputes. 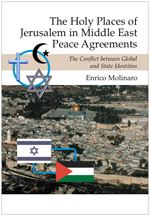 This multidisciplinary study offers two competing political ways of interpreting these disputes and the Arab–Israeli conflict in general: the state/national (territorial) perspective focuses on Israelis and Palestinians as the two main groups entitled to possession of and worship in Jerusalem’s Holy Places; the global/transnational perspective, on the other hand, entitles millions of Jews, Christians, Muslims and their respective clergy worldwide to raise claims to the city’s Holy Places as universal symbols of devotion and worship. This work provides international law practitioners and Middle East scholars with a thorough overview of the legal, historical and diplomatic interpretation of the provisions embodied in the international documents adopted in the Middle East Peace Process. In addition to applying the legal notion of international local custom, this study provides three alternative terms to express the three different meanings of sovereignty namely, independence, authority and title. Based on his work’s methodology and conclusions, the author has initiated second track meetings behind closed doors between Israelis and Palestinians, which have resulted in a political–diplomatic data-base. Those seeking a deeper understanding of the intricate legal terminology surrounding Jerusalem will find the main results produced by these meetings to be of particular interest, such as The Guidelines for a Jerusalem Statute, wherein both parties share cultural–religious principles towards building a better coexistence in Jerusalem (Annex III), and The Glossary of historically complex terms such as Status Quo and Holy Places (Annex IV). (d) Article IX of the Peace Treaty between Israel and Jordan, signed on October 25, 1994, titled "Places of Historical and Religious Significance and Interfaith Relations"
“The status of the Holy places in Jerusalem is central to any resolution of the Israel-palestine conflict. It is not for nothing that the late King Husayn of Jordan suggested that ownership of the Temple Mount belongs to g-d. From a more mundane perspective, however, the Holy places must be regulated through international as well as domestic legal instruments. Enrico Molinaro ... approaches the subject through the prism of two competing collective identities: the global/transterritorial model and the state/territorial model. Molinaro may very likely be correct in his policy prescriptions, but the legal analysis he uses to reach it is not without controversy. For example, Molinaro’s analysis places considerable weight on the legal status of the so-called “Status Quo.” The “Status Quo” is the term given to the collection of (often contradictory) firmans or decrees issued by the Ottoman sultans concerning Christian “rights” or “privileges” in the Holy places (i.e., question of possession, access, repair, houses of worship, internal administration, etc.) These rules were collectively “enshrined” in international law by the 1878 Treaty of Berlin and the British Mandate for palestine and later reaffirmed by Jordan in 1948. The exact legal authority of the Ottoman “Status Quo,” however, is unclear. The Ottomans viewed the firmans as an extension of privileges granted by the sultans. In contrast, the Christian communities viewed them as having the quality of rights. Equally important, the “international law” consequences today of the Treaty of Berlin and even the League of Nations Mandate for the State of Israel is an elusive matter. Molinaro argues that the Holst letter forms an “integral part” of the Oslo Agreement and has legal implications for the Israeli government. Most international lawyers, however, would follow Ruth Lapidoth’s view that the letter is a mere statement of policy of the Israeli government at one moment in time. Israel, for technical reasons, reaffirmed the principles represented by the “Status Quo,” but not the “Status Quo” in terms. As Molinaro points out, it did use the term in the Fundamental Agreement between the Holy See and the State of Israel signed in 1993. Similarly, Molinaro holds the outlier view that the 1924 Mandatory Order-in-Council removing issues of Holy places from the Mandate courts and placing them in the executive branch was a temporary measure designed to facilitate funneling of those controversies to the (never created) multi-religious Holy places Commission (or failing that, to a committee of the League of Nations). However, while this view has been considered heterodox, recent work by Raymond Cohen in Saving the Holy Sepulchre suggests that Viscount Samuel, the then British High Commissioner for palestine, had something like this view in mind (i.e., reference to an international body) when the Order was proposed in 1924.